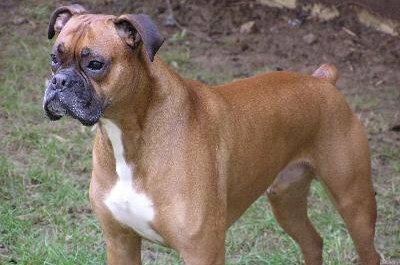 Boxers are susceptible to several genetic health problems. Intelligent, affectionate and energetic, a boxer makes a great family pet because of his playful and loyal nature. Although typically healthy and strong dogs, boxers are still susceptible to several medical conditions. If you suspect your boxer has a health issue, consult your vet for diagnosis, treatment and medical care. The two most common heart health issues boxers suffer from are aortic stenosis and boxer cardiomyopathy. Aortic stenosis occurs when the aortic valve narrows, reducing blood flow and forcing the dog's heart to work harder to supply blood. The reduced blood flow can cause fainting spells and might even result in sudden death. Boxer cardiomyopathy is a hereditary disease that causes a dog's heart muscles to deteriorate. In members of the boxer breed, this disease initially affects the parts of the heart that regulate heart rhythms, causing the organ to beat erratically. Symptoms sometimes include weakness and collapse, but unfortunately this disease often manifests itself in sudden death. 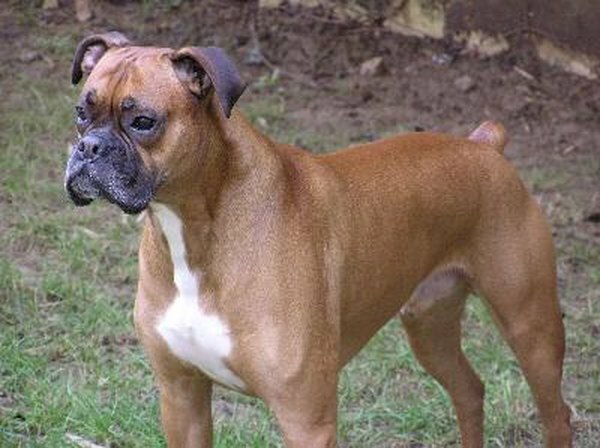 Boxers also suffer from several digestive problems, including histiocytic ulcerative colitis, a chronic inflammatory bowel disease known to primarily affect the younger members of this breed. The chronic inflammation causes sores to form in the lining of the large intestine and triggers frequent bouts of diarrhea. The boxer breed is also very susceptible to bloat, a condition that occurs when the dog's stomach becomes distended with air and then starts twisting in on itself, cutting off the blood supply to the digestive organs. This condition often occurs when dogs eat too fast or exercise vigorously just before or after a meal. Dogs suffering from bloat must be treated promptly by a veterinarian or they could die. Boxers are more likely to develop thyroid diseases than many other dog breeds. The most commonly suffered glandular disease in boxers is hypothyroidism, a condition that occurs when a dog's body doesn't produce enough thyroid hormones. Often caused by a damaged or destroyed thyroid gland, affected dogs often experience dramatic hair loss and significant weight gain. You might notice your sick dog's coat turn coarse in texture and lose its luster. Fortunately, this glandular disease typically responds well to thyroid hormone supplements. Like members of other large breeds, boxer dogs are also prone to developing hip dysplasia, a genetic disorder in which the femur bone doesn't fit properly into the hip socket. This degenerative disease is quite painful and can cause severe lameness of the hindquarters over time. There are several surgical techniques that can correct or help this progressive health problem, however. Boxers are also susceptible to demodectic mange. This skin condition is caused by Demodex mites, parasites that live on the skin of all dogs. Most dogs aren't affected by these pests, but dogs with compromised or weakened immune systems often experience allergic reactions that result in a non-contagious type of generalized mange. Members of the boxer breed occasionally suffer from food or environmental allergies. The allergens can cause the skin to itch, form scales and even become infected.